There’s a lot to consider when you’re moving your Orlando business. On top of all the moving woes of getting your employees prepared for the move, sorting and packing your furnishings, equipment, inventory, and supplies, along with the other daunting tasks of relocating, you’ll also need to ensure your paper and online presence moves with you to your new location. The last thing you want is to experience a drop in business during the moving process. In part one of our short blog series, we will look at five tips from our moving pros at J & J Metro Moving and Storage to keep in mind before and during your business relocation. 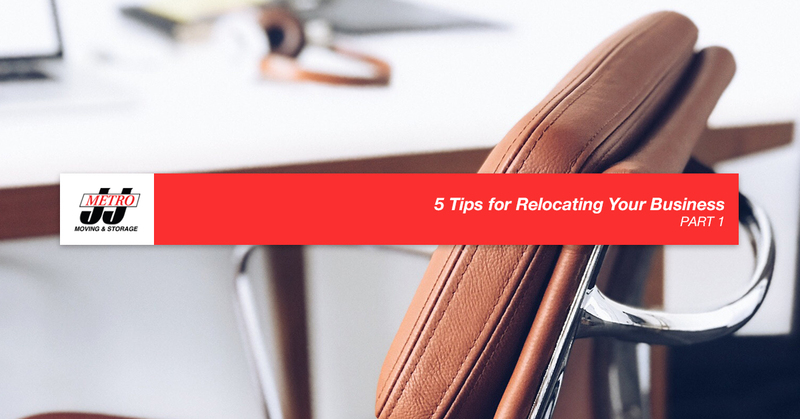 Following these simple steps will help ensure all your bases are covered for a smooth relocation of your business every step of the way. Moving a business takes a lot of planning. Early planning and detailed preparation are the best ways to tackle your commercial move in the most efficient and organized way. Additionally, getting a head-start on tackling the numerous tasks that come along with relocating a business can save you time and money in the long run. Getting a jump in your planning will allow you to establish a realistic budget to work with, while also giving you the opportunity to consider, and plan for, any unforeseen circumstances that may occur in the time leading up to, and during, your move. Once you have determined that you will be relocating your business, you should start letting people know about the big move right away. Along with making your existing and potential customers and clients aware of your relocation, you will also want to notify your current neighbors, community partners, and friends that you will be relocating. Make sure to inform vendors, suppliers, and any businesses that rely on your company about your move. Give them an estimated move date, provide them with your new address, and any other pertinent information they may need. If you utilize email marketing, send out emails to customers and businesses letting them know about the move ahead. Use your social media accounts to tell people you are moving, and keep them updated on your progress. Temporary signs can be very helpful during your move. Interior and exterior signs work as an additional method of telling people that you will be relocating. Place window decals and small, poster-sized signs at entrances and in high-traffic areas or on bulletin boards telling people about your eventual move. You can provide as much or as little information as you choose on these signs, but the more information, the better. If possible, include the approximate (or specific) move date, the address of your new location, and any other information that may help people find you once you have moved. Early planning gives you time to determine whether or not you have enough storage space for the move so you can plan for additional storage space accordingly. It is always a good idea to start taking stock of your company’s equipment, specialized goods, furnishings, supplies, and inventory long before you physically move these items. You will want to make sure you have sufficient place for everything at your new location, and you will also want to consider if anything will need to be stored temporarily or long-term, at any given point during your move. A commercial storage facility can be incredibly useful if you are having renovations done on your new building that may continue after you move in. If you will need extra storage, contact a local commercial storage facility in Orlando, like us. We can store your company’s goods for as long as you need in our vaulted, state-of-the-art storage facility. Whether you’re relocating your boutique and need to store display and inventory items, or you’re a local construction company with large equipment that needs to be stored, J & J Metro has you covered. As your trusted commercial movers in Orlando since 1968, the J & J Metro Moving and Storage team is here for you. We can provide you with professional packing and moving services to make your commercial move as straightforward and stress-free as possible. From hospitals to industrial companies, or a small chiropractic office or retail boutique, there is no job too big or too small for the J & J Metro team. We will handle everything from coordinating each step of the move and carefully packing your property, to relocating computer networks and reinstalling office furnishings. If you have a commercial move in your future, call your friendly and reliable commercial movers in Orlando at J & J Metro Moving and Storage to request a free, no-obligation estimate. Join us next time as we continue looking at more helpful tips to make your commercial move as painless as possible.